Tower clock face exterior view. 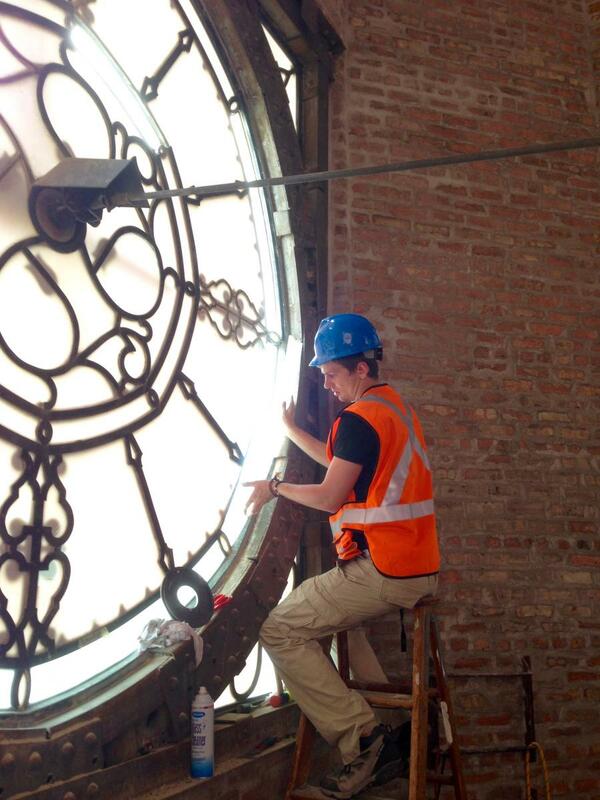 Suevel Studios of Arlington Heights, Illinois got the job of restoring the four leaded glass clock faces on the tower of Chicago’s 1930 Lane Tech High School. This facility is the city’s biggest public high school, with 4,200 students. The clock faces are about 8 feet in diameter and the glass enables them to be visible at night, when lit from within. The goal was to fully restore the faces, rectifying the damage, half measures and workarounds that had accumulated through the years. These included replacement of broken or cracked glass pieces, removal of graffiti, cleaning of the glass and replacement of broken sections of the metal framework. All the damaged glass and bronze metal stops were fully documented by labelling and photography. The glass is translucent and one quarter inch thick. It was specially fabricated by Kokomo Opalescent Glass Company, in Kokomo, Indiana. 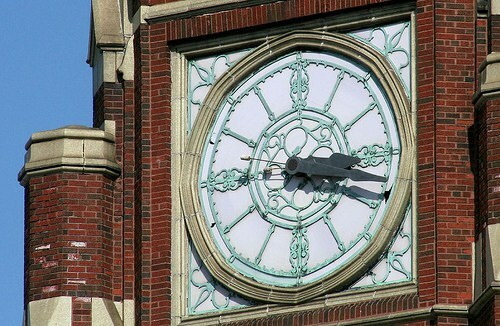 The clock faces are a part of a $50-million dollar renovation project for the Lane Tech building. Tower clock face interior, fitting glass. This entry was posted in Stained Glass and tagged Clocks, Illinois. Bookmark the permalink.